Climbing Mount Fuji (3776 meters), Japan's highest and most prominent mountain, can make for lifelong memories. The mountain itself may look more attractive from afar than from close up, but the views on clear days and the experience of climbing through the early morning hours among hundreds of equally minded hikers from across the world, are very rewarding. July and August are the official climbing season. During the two months, the mountain is usually free of snow, the weather is relatively mild, access by public transportation is easy and the mountain huts are open. Everybody without much hiking experience is strongly advised to tackle the mountain during the official climbing season. Climbing Mount Fuji is very popular not only among the Japanese, but also among foreign tourists, who seem to make up more than a third of all hikers. 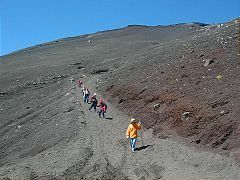 The peak season for climbing Mount Fuji is during the school vacations which last from around July 20 to the end of August. The peak of the peak is reached during the Obon Week in mid August, when climbers literally have to stand in queues at some passages. 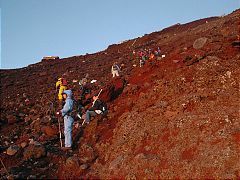 While you may want to avoid the Obon Week, we believe that by avoiding the crowds in general, you will miss out one of the most interesting aspects of climbing Mount Fuji, which is the camaraderie and unique experience of ascending the mountain among hundreds of equally minded people from across the world. Some mountain huts open a few days before the start of the official climbing season and/or remain opened until around mid September. Public transportation, however, is considerably less frequent or non-existent outside of the official climbing season. While there is usually no or only little snow on Mount Fuji from late June until October, temperatures at the summit can drop to far below zero in the shoulder seasons. Only experienced hikers should consider the ascent in late June or September. If there is snow on the mountain, appropriate mountaineering equipment and experience is required. Mount Fuji is divided into ten stations with the first station at the foot of the mountain and the tenth station being the summit. Paved roads go as far as the fifth station, which is around 1400 to 2400 meters above sea level. 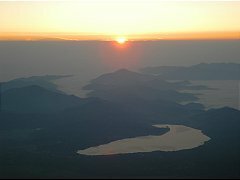 This is the most popular base for the climb to the summit, and the most easily accessible 5th Station from the Fuji Five Lake region and central Tokyo. 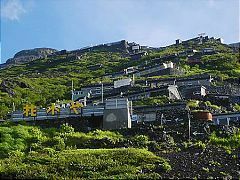 The road to this 5th Station, the Fuji Subaru Line, is a toll road (2300 Yen), which gets closed to private vehicles during the peak of the summer holidays (August 7 to 18, 2009). The Yoshidaguchi Trail leads from the Kawaguchiko 5th Station to the summit. Lots of mountain huts line the trail around the 7th and 8th stations, and there are separate trails for the ascent and descent. The sunrise takes place on this side of the mountain. This 5th Station is located only at 2000 meters above sea level and is the base of the Subashiri Trail. 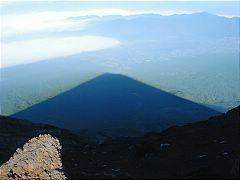 The Subashiri Trail meets the Yoshidaguchi Trail around the 8th station. This is by far the lowest 5th Station, and the ascent to the summit is accordingly much longer than from the other 5th stations. The Gotemba Trail leads from the Gotemba 5th Station to the summit. There are about four huts around the 7th and 8th station. The closest 5th Station to the summit, the Fujinomiya 5th Station is the base for the southern approach via the Fujinomiya Trail. It is easily accessible from the railway stations on the Tokaido Shinkansen Line between Tokyo and Osaka. There are about half a dozen mountain huts along this trail. The road to the Fujinomiya 5th Station is toll free and gets closed to private vehicles during the peak of the climbing season (July 15-17 and August 5-14, 2006). Most people try to time their ascent in order to witness the sunrise from the summit. Also, the chances of the mounatin being free of clouds, are highest during the early morning hours. The recommended way of doing this, is to climb to a mountain hut around the 7th or 8th station on the first day, spend some hours sleeping there, before continuing to the summit early on the second day. Note that the sunrise takes place as early as 4:30am to 5:00am in summer. Another popular way is to start climbing the mountain around 10pm from the 5th Station and hike through the night to reach the summit around sunrise. Obviously, this is a more tiring way of climbing the mountain and brings an increased risk of falling victim to altitude sickness (see below). A walk around the crater takes about one hour. 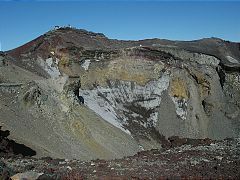 The mountain's and Japan's highest point is located immediately next to the weather station on the opposite side from where the Yoshidaguchi Trail reaches the summit. The Kawaguchiko Trail is lined by more than a dozen mountain huts between the 7th and 8th station. Other trails have much fewer mountain huts. An overnight stay typically costs around 5000 Yen per person without and around 7000 Yen per person with two meals. During the peak, expect the huts to be extremely crowded. The Fuji-Yoshida City website (see below) lists phone numbers for reservations. The ascent to the summit does not pose any major difficulties regarding climbing skills. Only at some points, the terrain is rather steep and rocky. Abundant signs along the trail warn the hikers of other minor problems such as sudden wind gusts and falling rocks. However, the main challenge of the climb is the fact that it is very strenuous and the air gets notably thinner as you gain altitude. Bring proper protection against low temperatures and strong winds. It can be below zero at the summit, and strong winds often make it seem even colder. Bring rain gear, as weather conditions can change very quickly in the mountains. Gloves are recommended both against the coldness and for hiking the steep, rocky passages. If you hike during nighttime, a flash light is highly recommended in any season and essential outside of the peak season, when the trail is not illuminated by other hikers. Most people choose head lamps, as they leave both of your hands free. Particularly on the trails where there are few mountain huts, it is important to bring enough water and food. Mountain huts offer various meals and drinks. Note, however, that prices increase with the altitude. Also, be prepared to carry home all your garbage as there are no garbage bins on Mount Fuji. The human body requires some time to adjust to a sudden increase of altitude, otherwise there is a risk of headache, dizziness and nausea. Quite a few people, who climb Mount Fuji, fall victim to altitude sickness. To avoid altitude sickness, you are advised to tackle the mountain at a slow pace and make frequent breaks. An overnight stay at a hut around the 7th or 8th station is recommended as opposed to a straight climb to the top. Small bottles of oxygen, available at the 5th stations and mountain huts, can be an effective tool in preventing and fighting altitude sickness. Any advice or questions? Voice them in the forum!